I have not shot a local match with as much controversy as this one in a while. The 2 Gun Action Challenge Match in Tucson recently got a batch of MGM Targets steel including some double spinners. The double spinner is a challenging target requiring decent marksmanship, timing, and patience. See my video on how to shoot the MGM Double Spinner here. Most competitors had not shot one of these targets before. For a new shooter it can be daunting, but it can be done. I first encountered some of these targets in the mid 2000s at the MGM Targets Ironman 3 Gun. I and others had to figure out how to shoot them on the clock and we got better at it over the course of the match, and better at it over the course of years encountering them. Some people will write these targets off as carnival props. I would disagree with that sentiment. The plates roughly represent the areas of the human head and center vitals and they move. Until we have target drones that are cost effective to move around the range gravity or mechanical moving targets are as good as it will get for many of us to practice live fire. Don’t Game it, Do the hard things. Local matches are organized practices sessions that prepare us for larger major events, or simply allow us to test our skills and gear month to month. A local match is the time to fail and try to get better the next time. In the end only 3 of us rotated both the rifle and pistol double spinners. Most shooters could not do it with rifle and only a fraction could do it with handgun. Many attempted and gave up because their marksmanship was not up to the task, or in some cases fired enough rounds to count it as engaged and moved on. Let me reiterate, a local match is the time to learn how to do these things and simply opting out when there are no prizes or trophies is selling ones self short. The match staff got a lot of feedback during and after the match about how unreasonable or impossible the double spinner was. Some said they are used to shooting CQB distances only and they weren’t ready for it. Some said the equipment the 3 of us had is what allowed us to rotate it. Equipment matters a lot less than skill level. One shooter did it with a .308 with red dot (after the paint had been shot off and the target obscured into the backdrop). It is true that .308 rotates it more easily, but .308 is a disadvantage on every other stage at the match due to capacity, more recoil, and muzzle blast. Without the right skill the .308 alone would not have allowed him to do this. 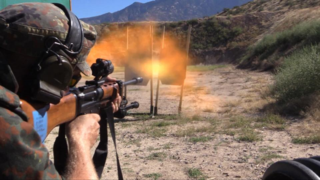 Karl Kasarda shoots his FG42 repro in .308. It may move steel harder, but it makes everything else at the match harder. Another shooter did it with a lightweight 16″ AR15 with low mass carrier, and some argued his minimal sight disruption with this system allowed him to shoot faster and rotate the target because of more rapid hits. This particular shooter is also a veteran of multiple Ironman matches, so again I believe the skill mattered more. Pistol: Suarez International Glock 17 with Warren Tactical Sights and Inforce APL. My rifle had no real inherent advantages over other rifles used at the match. I shot with the scope on 2x to simply get a better view with the paint gone. My normal method of double tapping the plates did not work because the position we were shooting from was not stable enough and the transition time between shots was better spent moving to the other plate than trying to recover quickly enough for a second shot on the same plate as it moved rearward. Ultimately I rotated it shooting top-bottom-top-bottom until it spun 360. I have shot these targets a lot, and I have done it before with a red dot only. The shooting platform made it harder, and I figured it out 0n the clock and made it work. Problem solving on the clock is one of the more valuable things people can get out of shooting matches. Developing the will to prevail despite adversity is another important factor. I heard people complain that the lack of stability made their chosen equipment less effective, such as scopes blacking out as eye relief changed under recoil. I also heard complaints that the body position required to support made it harder or was a factor in giving up. If people are experiencing these things in a match environment and they ostensibly own rifles for self defense or SHTF purposes they are most certainly selling themselves short if they don’t adapt and overcome. Going to similar events all the time can indeed make people complacent about their skills. One way to shake this up is to go to different events and see what they have to offer. I give credit to the 2GACM crew for not letting their match stagnate and changing it up. Too many matches today are based around mean equipment and mean skill level. A match is more interesting when it tests “can this be done at all” vs “how fast can it be done”. The other stages were typical 50 yard close range events. Stage 4 (the last one in the video) also caused people some problems. I did not shoot it as clean as I would have liked, but it was worse for others. My friend that used an RMR equipped Glock did better on this one than I did. This was the first match I’ve used the Vortex 1-6 Razor HD at. I was pleasantly surprised how easy it was to transition to using thanks to the daylight visible center illuminated dot. I will be doing a review of this optic after I get some more matches in with it.